our Art, Copy & Code project to partner with iconic brands, such as Volkswagen and Burberry, to reimagine how technology and creativity come together in advertising. In our latest collaboration, we’ve teamed up with Nike, Wieden + Kennedy, Mindshare and Grow for a new take on watching live sports. Today, watching live TV is a much more active experience because our devices are always within reach—on the coffee table, in our pockets or on our laps. Nearly 80% of consumers watch TV with a laptop, tablet or mobile phone nearby. After major events, these screens come to life -- searches spike, and the “Did you see that?” moments become the must-have, real-time currency of the web. This behavior creates a massive opportunity for brands to be hyper-relevant, in an instant. Together with Nike, we developed a real-time campaign that lets global fans participate, remix and share in pivotal moments, just seconds after they happen on live TV. Real-time, reimagined: Through a specially designed, real-time ad delivery tool, display ads were shown across the web on sites and apps in the Google Display Network, within seconds of a Nike athlete's phenomenal play happening on TV. 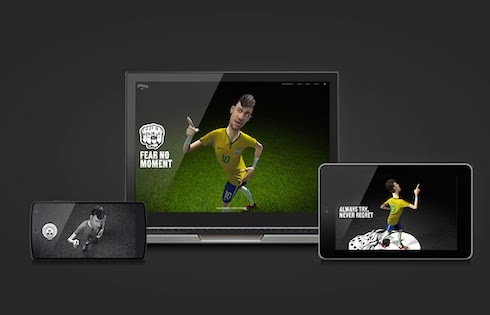 For example, when Brazil’s Neymar Jr. scored two goals in the first half of the Cameroon match and when USA’s Tim Howard had a series of incredible saves versus Portugal, Google technology allowed Nike to deliver ads celebrating the moment within 10 seconds of those events happening live. The cross-screen experience...now in 3D: Using modern browser technologies like HTML5 and WebGL, Nike’s athletes came to life in 3D across screens. On mobile phones and tablets, the campaign made particular use of the unique capabilities of mobile devices. Fans could span 360-degrees around the character by tilting and panning their phone, capturing their own perfect shot. Over the last few weeks, we’ve run eight ads celebrating real-time moments. And consumers are engaging. Over two million fans from 200 different countries have engaged with the Phenomenal Shot experience, creating over 500 thousand remixed moments to share with their friends. To see the ads and learn more about the campaign, visit ArtCopyCode.com. This project is the first in a series of projects to reimagine real-time marketing. While Nike is the first to use the new capability, there’s potential in all kinds of live events - from sporting events to award shows to reality TV. It’s an exciting step for brands looking to meaningfully connect with people, in real time, across the entire web. Watch this space for more updates later this year. Last year, we launched our Art, Copy & Code project to partner with iconic brands, such as Volkswagen and Burberry, to reimagine how technology and creativity come together in advertising. In our latest collaboration, we’ve teamed up with Nike, Wieden + Kennedy, Mindshare and Grow for a new take on watching live sports.